Science was always one of my favorite subjects in school growing up. I think science is so important and something kids do not always get enough opportunity to explore. Unfortunately, I am not very good at coming up with projects or experiments on my own for my kids to do. The Young Scientists Club has an awesome line of The Magic School Bus science kits that are a great way for your kids to have fun with science. "The mission of The Young Scientists Club is simple – to offer children quality, science-related products that will fascinate them with the wonders of scientific discovery and spark their interest in future scientific endeavors." The Young Scientist Clubs has fifteen science kits in The Magic School Bus series and all are for ages five and up. Perfect for introducing kindergarten age kids into the world of science! My boys had the chance to test out the Attracted to Magnificent Magnets Kit pictured above, which was a lot of fun. "Young Scientists go on a magnetic scavenger hunt, build a compass, make magnetic slime, design magnetic faces, experiment with lodestone, play magnetic games, hold magnetic car races, and much, much more! 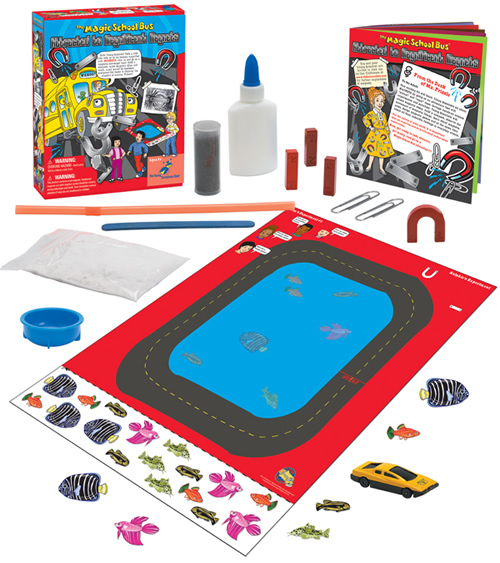 This magnified kit includes a colorful poster with a racing track, game board, and experiment diagrams." This kit comes with everything you need to preform a bunch of magnetic experiments including 4 magnets, iron filings and a couple pieces of lodestone. 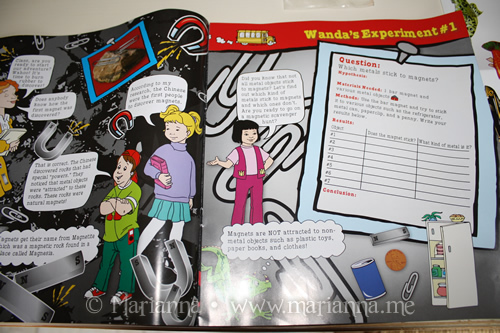 Also included is an experiment booklet with twelve experiments. 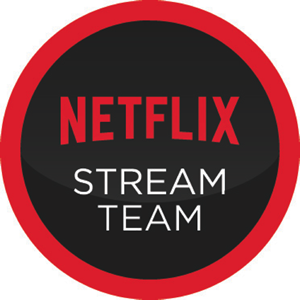 They are easy to follow and some have a section where you can write down your results and observations. I loved that the experiments cover all different difficulty levels. There are some really basic ones like seeing what magnets are attracted to. Then there are some moderate, for example creating your own compass with some bowls, a magnet and water. There is even an experiment for creating magnetic slime! 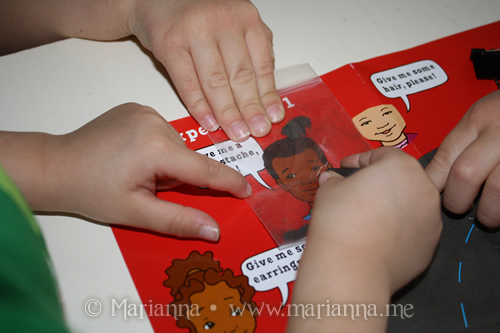 I decided to start off with a very easy experiment from the book to ease my boys into it. The first experiment is just using the magnets to see which types of items are attracted to them. We lined up all of the metal items and plastic items from the kit, plus I raided our drunk drawer in the kitchen for a few more things like pens and binder clips. This simple experiment was a hit and soon they wanted to roam around the kitchen to see what else would stick to their magnets. Next we skipped ahead to a more silly project. Do you remember those "Wooly Willy" toys when we were kids where you dragged iron fillings around a cardboard face to give him hair? Gosh those were so much fun! Well there is an experiment in this book that lets you do pretty much the same thing. The poster that comes with the kit has a few faces in one corner. A small amount of iron filings are placed in a tiny storage bag which is then placed over the face and you can move them around the face. The faces each have a specific thing they want you to create, but you can also let your kids have fun by making it look any way they want. 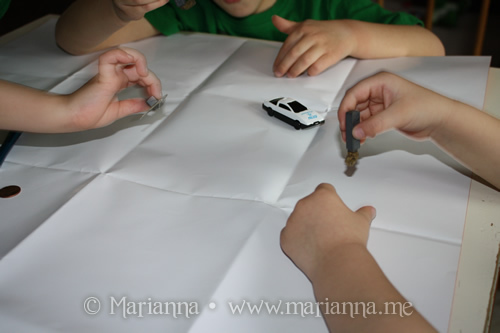 Overall, my kids had a blast learning all about magnets and experimenting with them. After we cleaned up the first day and put it away, they couldn't wait to get it out again and do some more. 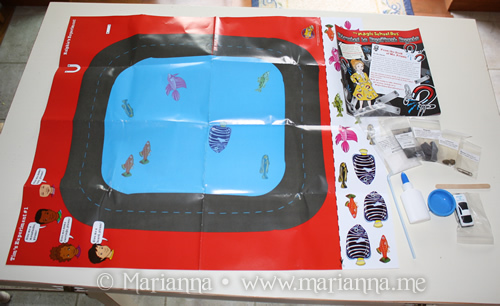 The Magic School Bus Attracted to Magnificent Magnets kit is available for $15.99 from TheYoungScientisClub.com. Connect with The Young Scientists Club on Facebook. That looks fun and educational.